"It's obvious that you're more than capable (and motivated! ), so allow me to officially invite you to join AG's staff. 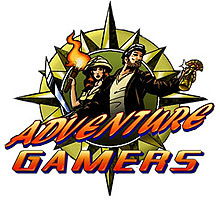 :)"
Adventure Gamers® is the premiere online destination for news, reviews and discussion relating to adventure games. Founded it 1998, it is now one of the foremost and widely respected websites about adventure games and is brought to you by an international team of editors, writers, news updaters and community moderators. Adventure Gamers® is a Trusted Reviewer at GameRankings and our reviews are listed on Metacritic. Needless to say, this is an incredible opportunity for me, and I can't wait to start contributing :) Click here to view my AG bio. (Adventure Gamers® information from the official website). 1. 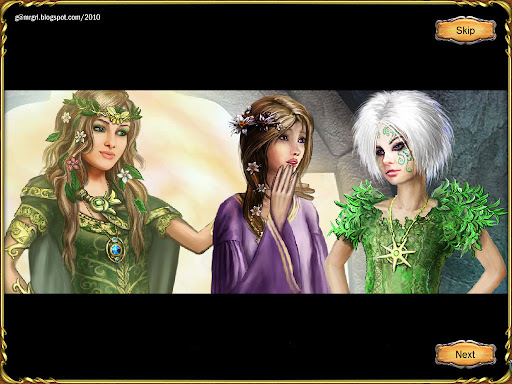 The Help pages (accessed from the main menu) explain the story and the game. 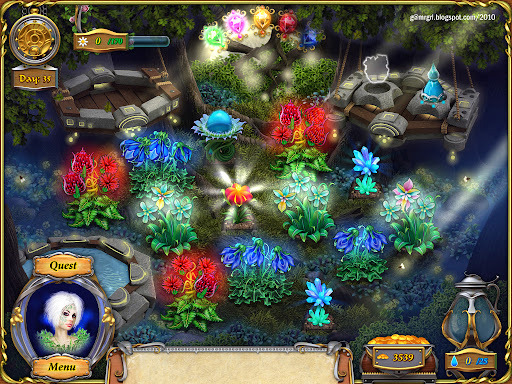 During the game, simple tutorials introduce new concepts. 2. Keep the water jug filled at all times to avoid losing plants. Use the fountain / Dewdrop plant whenever available to save money. 3. Hold off watering plants as long as possible to save water, since once the day is over, plants requiring water are automatically replenished. 4. Upgrade the flower holder capacity first, then the fountain. 5. 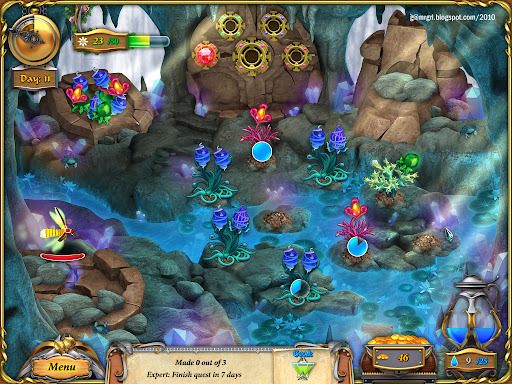 Though the game doesn't have chaining bonuses, it is quicker to do similar activities together: collect flowers in a continuous bunch and water needy plants sequentially (that way they will also be synchronised in their future water requirement). 6. 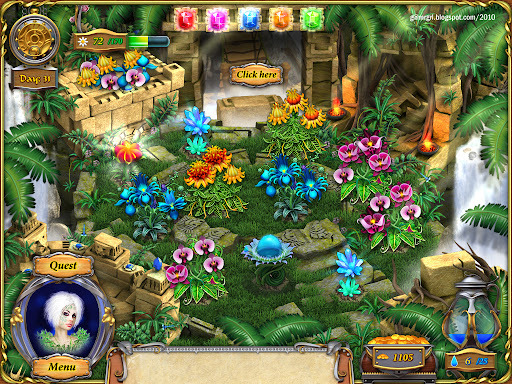 Each potion requires a combination of flowers in various quantities. Green means fully available counts, orange means partial availability, and red means unavailable. 7. Be careful not to sell off the quest potions. 8. If space permits in the harvest holder, save flowers for potions instead of selling them individually, as potions earn more money. 9. Potions can also be made partially depending on available flowers, which keeps the harvest holder free. 10. A plant produces flower variants at random. In case Morgana wants high numbers of a particular variant, grow enough of that plant to ensure you get the adequate number of blooms in the given time. 11. Newly planted saplings need certain rounds of harvesting before they can produce complex flowers, so plants must be kept from dehydrating or being eaten by critters especially towards the later levels when complex potions require the upgraded variants of blooms. 12. The clock ticks loudly to indicate the last 5 seconds i.e. the 'end of the day' - listen for it and once it starts, collects blooms instead of killing critters or watering plants (unless of course, a plant is on the brink of dehydration). 13. Be extra careful of pests that 'pause' - boring beetles, salamanders, stone golems, spiders, hedgehogs - only to emerge a few moments later and continue chomping! 14. Some critters move quickly or fly, and are difficult to click on. 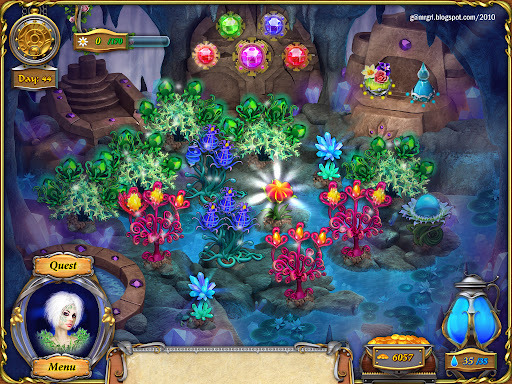 Wait till they attach to a plant (note the green health meter of the plant) and click rapidly to kill them. 15. Some critters are poisonous - stone golems, wasps, toads - and if clicked when they're radiating their green aura will cause the cursor to freeze for 2 seconds, which sounds like very little time but is actually quite disturbing. a) During the starting levels of a garden, when cash is scarce but so are pests: 1 Dewdrop near the water jug and 1 Pest Magnet near the edge. 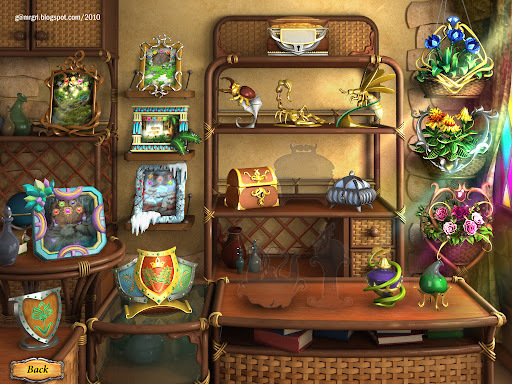 b) During the later levels of a garden, when cash is plenty and spells are available: 2 Pest Magnets at the garden's edges, 1 Fertiliser plant in the central area (surrounded by at least 3 - 4 plants). 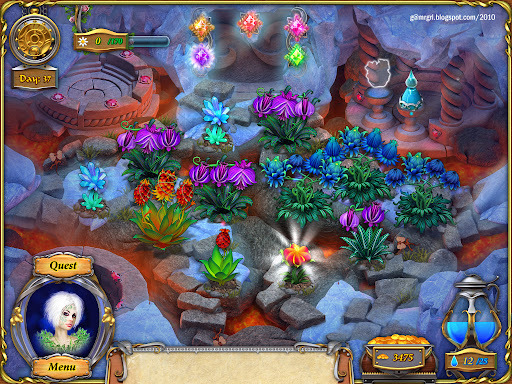 c) Use the Butterfly plant only for quests requiring quick plant upgrades. d) Avoid the Power plant in case Harvest and Rain spells are available. 17. Of the spells, first purchase Rain, since dehydration kills plants. 18. When cash permits, use Rain + Harvest spells. Put a Fertiliser plant in the middle of the garden, then use Harvest to gather all blooms. 19. The Pest Killing spell isn't required if the garden already has at least one Pest Magnet plant. 20. 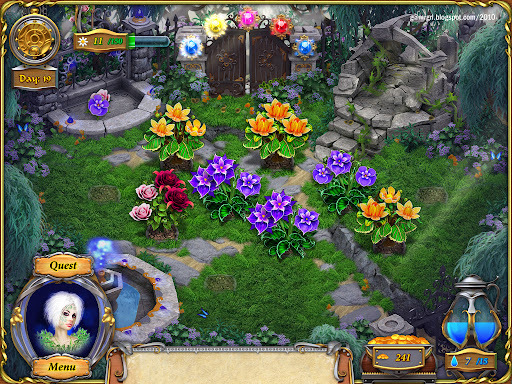 For the later levels, the garden should have at least 3 of each plant type. Sell off extra plants / change helper plants based on quests. This is an original Tips & Tricks written by me. Please do not distribute the text and images without my written consent. 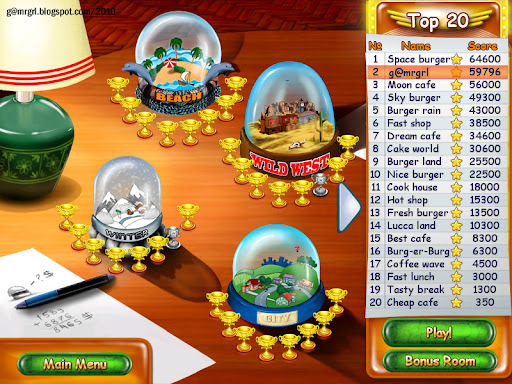 Burger Bustle is a time-management game that involves running a chain of cafes that occasionally serve coffee. There's none. The memo is short and sweet: do tasks, earn trophies. Prima facie, Burger Bustle appears to tread little new ground from the tried-and-tested time management format. Customers come into the cafe, browse the menu, place their orders. Servers scurry to fry up burgers, stuff them with cheese, lettuce and tomatoes, and a hint of ketchup for extra cash. Side dishes include three varieties each of ice-cream, sodas, coffees, desserts and fries. Customers may choose take-away or eat in the cafe; those who eat in sometimes leave tips. And then comes the twist - the 'strategy' part. This isn't a game that can be beaten by just skidding across the mousepad. Planning which counters to unlock, how to distribute available workers, and which tasks to priortise plays a huge part in winning gold. Multiple targets per level add to the challenge. There are eight 'locations' of the cafe - Beach, Wild West, Winter (surely this was lost in translation), City (screenshot), Shopping Center, Aqua Park, Hollywood and Space Station (screenshot), each with 8 levels, adding up to 64 for the game. 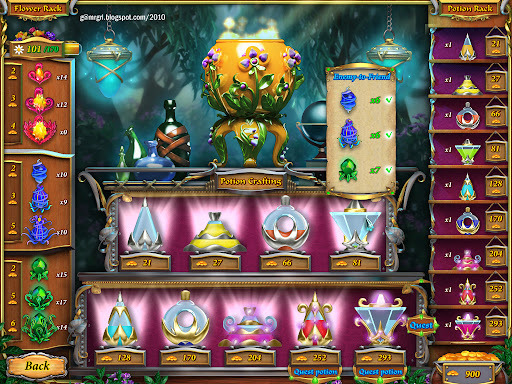 At the start of each level, targets are defined for 'gold' and 'silver' trophies. The time target requires task targets to be completed - minimum orders to be served and/or cash to be earned and/or particular burgers types or sides to be sold and/or staff to be recruited. Customer types are few (but range from blue collar workers to Japanese tourists) and remain constant irrespective of the cafes' locations. There's no significant difference in patience levels either; most are reasonable even with inordinate delays. Which is a saving grace, because the workers are woefully sluggish, and the sole in-game speed up is a coffee machine which takes over a minute (with levels averaging 2 - 3 minutes) to recharge after a 10-odd second use. 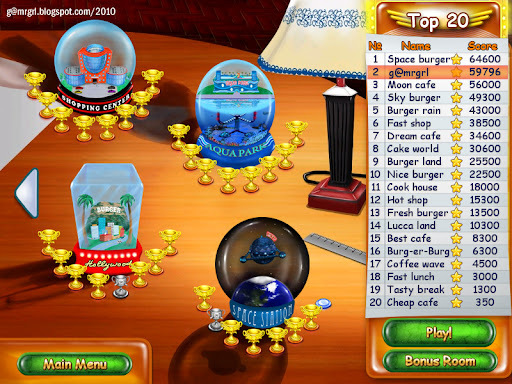 After a few levels the cafe gets a gramophone (in a burger shop?) and candy that can be used to soothe irate customers. Other positive elements include the facility to serve customers by clicking the right mouse button on the item rather than have to drag it to them; there is also no 'overnight wastage' - money deducted on leftover items when the shop closes, nor any penalties for discarding useless items except the time lost in handling them. 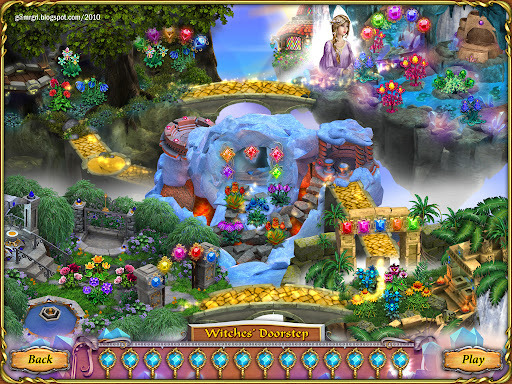 Each level has three decor upgrades - flooring, walls and tables, which improve tipping. There is no cash implication to purchasing them, so the feature appears cursory. Great? Not quite. 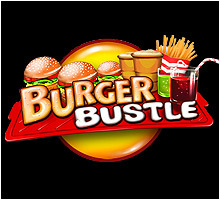 Burger Bustle suffers from a near-crippling glitch - customers often do NOT order the items required to complete tasks for many, many rounds. This wastes precious time, and renders the player helpless and frustrated. The worst afflicted levels are 14 (Wild West), 53 (Hollywood) and 64 (Space Station), for which gold targets appear improbable thanks to lack of ordering of critical items. Another problem is that bonuses (upgrades) are 'awarded' on the player moving up a pre-set leaderboard. Even after completing all eight locations with 60 (of 64) gold trophies, I managed to make it to only number 2, short by over 4000 points, though the scores for each level are 'fixed' in terms of targets - achieving targets faster does not earn additional points. Not being able to choose an upgrade also hampers gamers from maximising their individual game-play strengths. 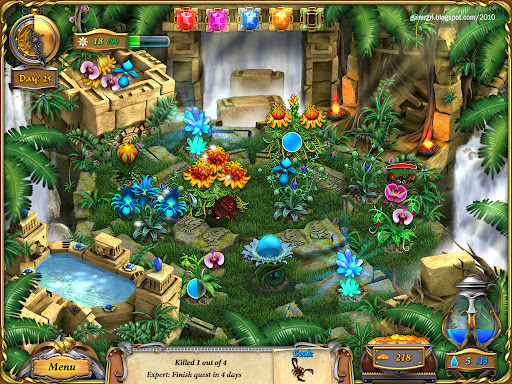 The game has two additional modes which extend playtime by several hours - "Survival", unlocked when the player ranks 8th on the leaderboard, and "Relaxed", unlocked at rank 2. 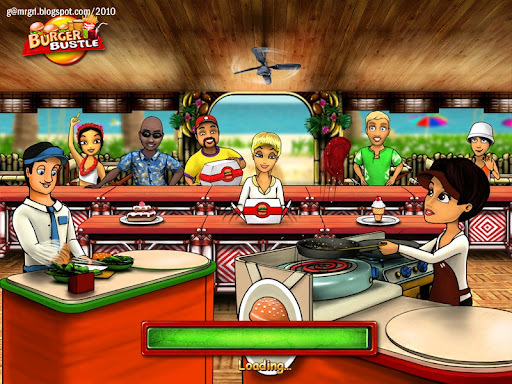 Survival mode has the player racing against the clock to meet orders as customers increase and patience levels decrease, till 20 customers are lost. Relaxed mode is untimed, pressure mounting as customers increase along with order complexity. 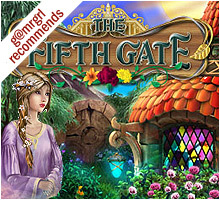 The art is vibrant and attractive, with smooth, clear graphics. Overall the game is a visual pleasure with above average production quality. The game has very little text, keeping it crisp and free of typos. The voice-acting is good, but the limited sound-bites get repetitive after a few levels. The music is functional and remains in the background. 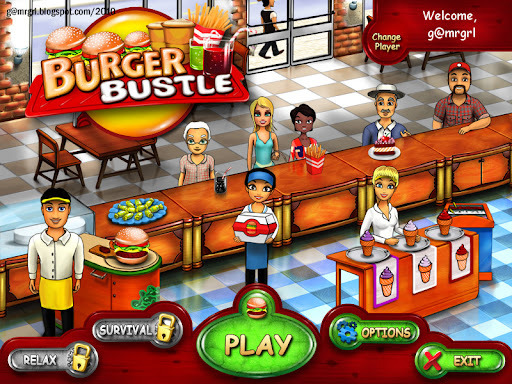 The biggest strengths of Burger Bustle are its perfect length and challenging game-play. The speed + strategy approach keeps the gamer engaged its entire duration. There's no getting bored with this game, and the only regret is the glitch of ordering task items that reduces its overall satisfaction score.